The new 911 Turbo S Exclusive Series from Porsche is the most powerful and unique 911 Turbo S ever. The Coupé provides 446 kW (607 hp) and is limited to 500 units worldwide. In addition to a power increase of 27 hp, the 911 Turbo S Exclusive Series is distinct from the standard 911 Turbo S due to its unique design, higher-quality materials and luxurious details. The sports car is being intricately finished by hand in the new Porsche Exclusive Manufaktur at the headquarters in Zuffenhausen. Previously known as “Porsche Exclusive”, the in-house workshop specialises in tailoring to customer wishes, as well as being responsible for limited-edition series. And for the first time ever, Porsche customers can have the matching chronograph from Porsche Design configured in the same design as their sports car. The passenger compartment is both elegant and unique. The 18-way adjustable sports seats are covered in two layers of perforated leather. The inside layer has two stripes in Golden Yellow, guaranteeing a unique effect. 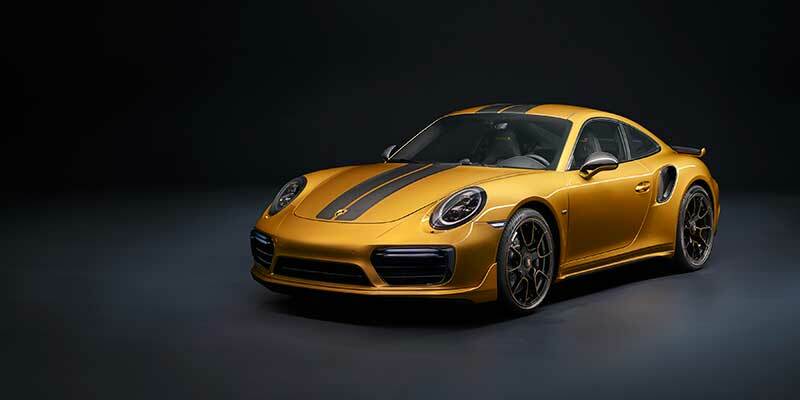 The seams and the Turbo S lettering stitched on the headrests are also in contrasting Golden Yellow, and the roof lining is made of Alcantara with a Golden Yellow double-stripe look. Fine copper thread is integrated into the trim strips of the carbon interior package. The plate featuring the limited-edition number on the passenger’s side underlines the car’s exclusivity. The door entry guards, also finished in carbon, come with illuminated Exclusive Series lettering. For more than 30 years, Porsche customers have been able to enjoy extensively customised individual pieces. With the introduction of this new limited production run, the sports car manufacturer is beginning a new chapter: Porsche Exclusive will now be presented across the globe with the new “Porsche Exclusive Manufaktur” brand. This inhouse workshop specialises in bespoke Porsche modifications. The range of services available also includes advising customers, developing special equipment options for each model range and producing limited production runs. Prices for the 911 Turbo S Exclusive Series including VAT and country-specific equipment will start from EUR 259,992 in Germany. It will be launched on June 8, 2017. The Porsche Design Chronograph 911 Turbo S Exclusive Series will be available in Germany, starting at EUR 9,950. The watch can be configured to the customer’s requirements when they buy the vehicle and is available at Porsche Centres. The luggage set costs EUR 5,474 in Germany and is available in conjunction with factory collection or from Porsche Tequipment at any Porsche Centre.